Back in California I had the happy duty to volunteer as a judge and speaker for a variety of camera clubs, county fair photo competitions and school events. Moving to the St. Louis area, it was starting from scratch in terms of local “tribal knowledge” and I’ve come to adore my GPS like Lewis and Clark must have loved their compass. It takes awhile to immerse ones self in the local culture. 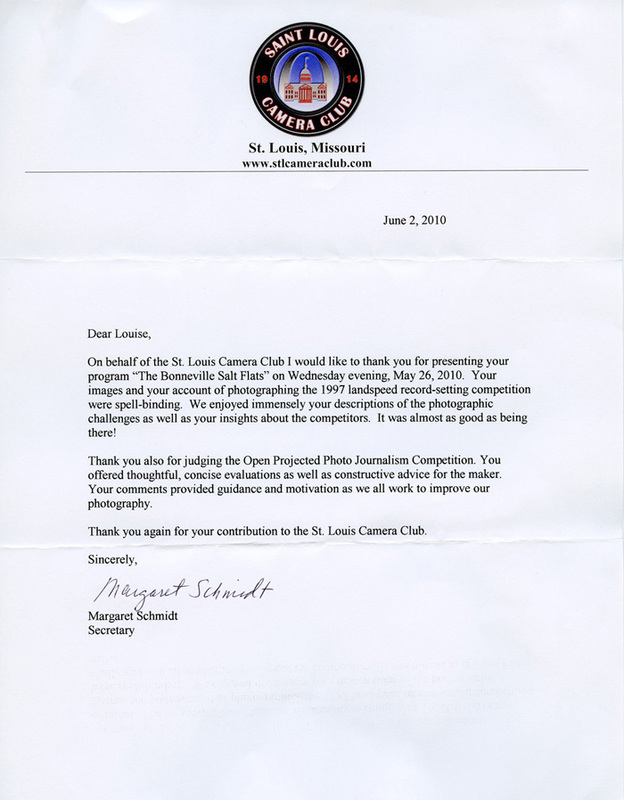 A few months ago I read a news item on an exhibition by the St. Louis Camera Club and gave them a ring to see if I might be of service to the group. Not just another quaint bunch of hobbyist photographers, I was bowled over to discover this was the second oldest camera club in the United States, only four years short 100 active years! Only the New York Camera Club is older. The group has more than 500 members and meets not once a month, but once a week attracting a full room every seven days. That means plenty of volunteer coordination and personal time by the five program chairs (color, nature, photo travel, photojournalism,prints) to dream up topics and seek out speakers. Besides the executive board and directors, there are 18 fully staffed committees and a well-designed website: www.stlcameraclub.com. It was to this august body of visual enthusiasts that I trotted out my presentation on land speed racing talking about what goes on at Bonneville, but focused on the 1997 Supersonic Showdown in the Black Rock Desert between the British and Americans. As usual, most of the audience didn’t have a clue about the sport so it was a delight to give ’em peek at the world’s fastest fun and games. In the second half of the evening, I judged several competitions — very difficult because the club has some damned talented shooters in the ranks. Afterwards, about a dozen folks invited me out for desert and/or drinks at a nearby watering hole. A real friendly and gracious bunch. I have been already invited back to give another talk in January on Bonneville and class racing. When the unsolicited letter of thanks came I thought it would be interesting to share the experience with all of you. Land speed racing has a long and storied heritage, much like the American wild west, but all the ponies are under hood these days. Mostly unknown outside automotive and motor sports circles, my presentations offer an intimate perspective into “go fast” Americana where the “can do” spirit finds ordinary people doing extraordinary things. Men and women, young and old, the highly skilled next to the mighty lucky, put on a boisterously brilliant mechanical circus set on sparkling white salt laboratory where dreams come true on a certified time slip. With each run, the question is answered, time and time again: How fast will it go? If you have a school, club or business gathering that might get a kick out of learning a bit about the worlds’ fastest cars, trucks and motorcycles, get in touch with me through his website and we can discuss how to bring the stirring spirit of high-speed adventures to your group. I always have such an incredibly good time doing these shows. From a giant, packed room at Roush Racing, the overflowing main lecture hall at Ferris State University, colleges, high schools and primary schools to the keynote luncheon speaker for the Federal Laboratory Consortium (FLC), numerous SAE chapters across the country as well as museums around the world, bringing the sport of land speed to the public is rewarding as it is enjoyable.